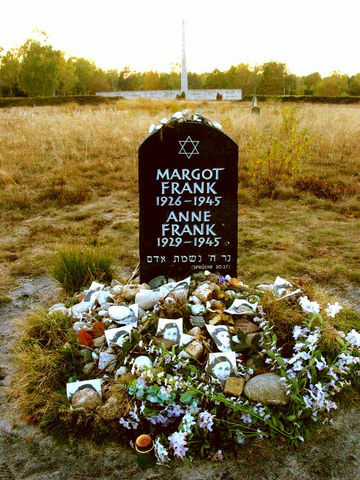 The young diarist Anne Frank, along with her sister Margot, died 70 years ago this month in the Bergen-Belsen concentration camp near Bergen, Germany. She was 15 years old. British soldiers freed the camp only six weeks later. Anne began keeping a diary two days after her 13th birthday, June 14, 1942. When Margot was ordered to report to a work camp the following month, Anne and her family went into hiding in the “secret annex” at Prinsengracht 263-267, Amsterdam. Her father Otto, the family’s sole survivor (their mother Edith died at Auschwitz), published Anne’s diary a few years after the war. It has since appeared in over 60 languages. I attended WWW9 in Amsterdam in May 2000. I went to the see the hiding place—the Anne Frank House—twice while I was there. The experience created an unforgettable wound that has not healed. Anne and her family lived in an apartment at Merwedeplein 37-2, also in Amsterdam, from December 1933 until July 1942. The Merwedeplein complex was walking distance from my hotel. I discovered there a quiet green next to the apartment building. I sat on a bench. The weather was cool, partly cloudy. There were no tulips as the season had just past. Three children, two boys and a girl, played soccer in the park on that carefree spring day. It was clear from their clothing that they were orthodox Jews. Amsterdam left a little part of itself in me. Anne’s death was one of millions. We know about Anne because she wrote, and her work has been read and cherished for decades because she was innocent and honest and articulate. But what about the silent millions who left little evidence that they even lived? Since visiting the United States holocaust museum in Washington, D.C., there has been one thing I could never get out of my mind: the smell of the shoes. On display in one part of the museum are thousands of shoes confiscated from concentration-camp prisoners. Those shoes are to me so utterly human and personal. I hear the silence. I mourn the mindless savagery of a political monster, checked too late to save 60 million lives. What to do with that silence, I don’t know. But I can’t ever forget it. I don’t try to forget it. On Anne and Margot’s gravestone are a few words from Proverbs 20:27, “The spirit of man is the candle of the Lord.” That candle will never go out.